Belle nouvelle marque et spacieux (130 m², sqf 1400) appartement dans le coeur de ville de Reykjavik. Vue sur l'océan spectaculaire. L'appartement est au 3ème étage avec ascenseur dans un nouveau quartier près de port de Reykjavik. L'appartement dispose de deux chambres et deux salles de bains. L'une des salles de séjour a canapé-lit et l'appartement dormir commodément 5 personnes. Cuisine avec réfrigérateur / congélateur et lave vaisselle. Laveuse / sécheuse dans l'appartement. 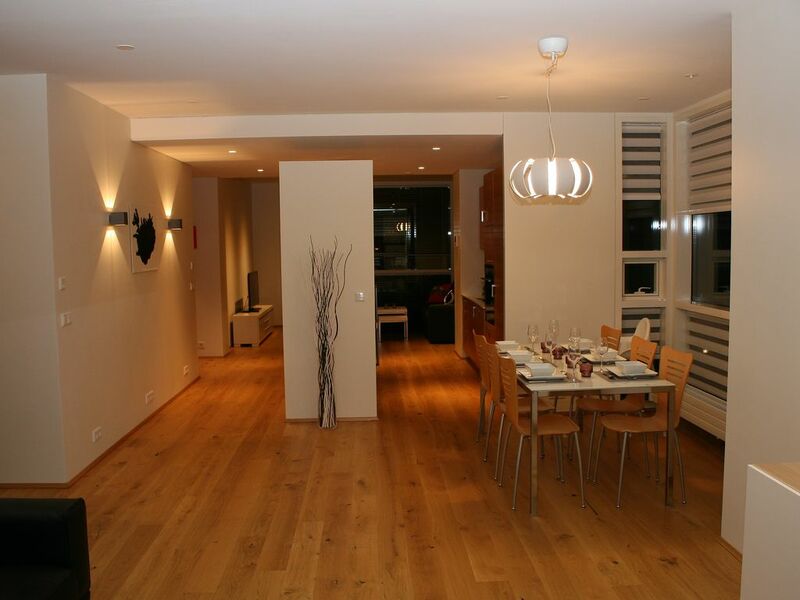 This is a beautiful, exceptionally well maintained property in a superb location in Reykjavik. The view is outstanding, (it says harbor but more like mountains across the bay). Very lovely to wake up and see view from basically floor to ceiling windows. The condo is up to date with great amenities such as parking, (a big plus as parking in Reykjavik is not easy), microwave, dishwasher, and plenty of serviceware & cookware. The wifi worked great and there is both elevator and stairwell for easy access. Margret & Sindri were wonderful hosts. We had a car issue and Sindri was very accommodating when he could meet us keys and show us the condo. Sindri also gave great recommendations for eating, grocery shopping & pools. The location is excellent with fantastic cute shopping, galleries, and excellent restaurants & gourmet food shops. The condo has ample storage, (way more than any 1-2 week traveler could ever use). The 2 bedrooms are furnished with eco cotton flannel sheets. Pillows were a little smaller than we are accustomed to, but bedding was very warm. Be sure to ask Sindri how to work the clothing washer/dryer. It was not like usual American washer/dryer and took a few tries to get it to dry, (but eventually we figured it out). The condo is quite spacious. It was very nice to have the space after traveling in the country for a week in smaller hotels. Worth the price. Just note - there is a hefty tax on all Icelandic hotels etc. In fact, taxes on all goods and sundries were higher than we anticipated.... as well as food. It was great to go food shopping and prepare our own food. It saved a lot of money from eating out. I would stay here again for sure! This apartment is as beautiful as depicted in the photos. We enjoyed the view daily as the light changed on the mountains. Margret and Sindri were very helpful and gracious. The apartment is equipped with everything we could need. Conveniently located to city points of interest and public transportation, yet very quiet. We loved our stay and would love to visit again! Einfach traumhaft schön, super ausgestattet und ein toller Meerblick! ich war mit meiner Mutter und meinem Ehemann für 9 Tage gerade erst dort und kann das tolle Appartement in Nähe des Zentrums und trotzdem direkt am Meer nur wärmstens empfehlen. Es ist gemütlich und sauber und mangelt an nichts (Herd, Mikrowelle, Essbereich, 2 Sofas/Wohnbereiche, Geschirr und Zubehör, sowie Grundlagendes (Salz, Pfeffer,...) sind vorhanden. Auch Sitzgelegenheiten direkt am Fenster mit Meerblick, 2 Schlafzimmer, 2 Bäder mit Handtüchern und Fön, eines mit Duschwanne, eines mit ebenerdiger Dusche). Die Vermieterin antwortet sofort auf Fragen und ist sehr nett. Wir wurden auch dort nett empfangen. Evtl. mitgeführte Mietwagen haben einen eigenen Stellplatz in der Tiefgarage unter dem Gesamtkomplex, von wo man bequem und trocken direkt ins Appartment kommt. Balkon mit Grilll ist auch vorhanden. Ein wirklich unvergesslich schöner Urlaub! Beautiful Apartment with great location and great view. Very accommodating. We were driving in from Vik and did not get to the apartment until midnight. They met us at midnight and gave us an overview of the area, where everything was in the apartment and how to use the appliances. Great location. Easy to walk to shops and restaurants and to the harbor for our puffin tour. Also fantastic view. The apartment was very modern and clean. We really enjoyed our stay. First: Upon the initial booking and arrival, Margret was super responsive and helpful with everything including allowing us to check in early on a holiday! Her representative met us at the apartment and thoroughly explained everything. Apartment: exactly as pictured and described. I never found extra blankets/sheets for the sleeper sofa but we didn’t end up using it so it wasn’t a big deal. Plenty of dishes and towels. The apartment is straight out of an IKEA showroom (cute, well proportioned, and minimalistic). The apartment was SPOTLESS and the view was breathtaking. Also, there was no sounds anywhere. Either the construction of this building is incredible or the neighbors are non-existent because we never heard or saw another resident throughout our entire 5 night stay. Wi-Fi only allowed 2 devices at a time but we had a mobile hotspot so it wasn’t a problem. Location: we were able to walk everywhere in Reykjavik from the apartment. It’s not city center but nothing we went to was more than a 15 minute walk. Being on the water and having such a lovely view made the apartment feel even bigger. Overall: we would definitely recommend staying here. Our preferences as a family were just that, preferences but the booking process, check out process, and our overall stay were delightful. Staying here with 2 kids aged 10 & 11 and my husband we never felt crowded or cramped. The building was secure and quiet and felt very safe. The ease of getting to shopping, restaurants, museums, etc was PERFECT. It is a new, nice and spacious apartment. It is in a great location and plenty of shops and restaurants, grocery stores, bakeries near by. Great view from the apartment as well. We enjoyed our stay here.